This entry was posted in Monty Python, Uncategorized and tagged Monty Python, Monty Python Live, O2 on June 30, 2014 by howardjohnson1985. John Cleese recently gave an interview to the Radio Times that’s been causing a bit of a stir. He appeared as Q in two Bond films (The World is Not Enough and Die Another Day), the last two Pierce Brosnan Bonds, and then the producers decided to hire Daniel Craig, jettisoning Cleese and any lighter approach they had taken up to that point. He said “I believe that they decided that the tone they needed was that of the Bourne action movies, which are very gritty and humourless. The Daniel Craig Bonds have been doing rather well internationally, so it’s hard to fault the producers. However, for those of us in the English-speaking world, it’s all been rather unrelentingly grim, with explicitly sado-masochistic villains, and beloved supporting characters dying violently. Many of us lived through the Roger Moore Bond years, when the misguided humor was as thick as the car chases. 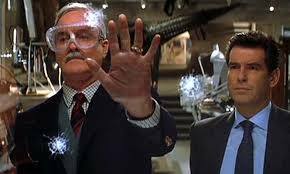 Anyone who saw Roger Moore tangling with Jaws and a buffoonish Southern sheriff didn’t complain about the Cleesian touches in the Pierce Brosnan films. I was working for John when the producers decided to go grim and gritty, and John was philosophical. The Daniel Craig movies are, like the Bournes, Die-Hards and other big budget action flicks, all about the visuals, at the expense of character, humanity, and any subtlety. John understood that, but it wasn’t a direction in which he was very interested in going. And, at risk of sounding like a bore, neither am I. This entry was posted in Monty Python, Uncategorized and tagged Daniel Craig, James Bond, John Cleese, Pierce Brosnan, Roger Moore on June 29, 2014 by howardjohnson1985. Thirty-five years ago this week, on June 27, 1979, the first Secret Policeman’s Ball was presented in London to benefit Amnesty International. It wasn’t the first Amnesty benefit, and it wouldn’t be the last, but it was certainly one of the best shows. In addition to John Cleese, Terry Jones, Michael Palin and Neil Innes, it offered a whole slew of other British comedy greats. And they didn’t come much greater than Peter Cook. This is one of the highlights of the highlights–Peter Cook playing opposite John in “Interesting Facts.” I think you’ll really enjoy this one. This entry was posted in Monty Python, Uncategorized and tagged Amnesty International., John Cleese, Michael Palin, Monty Python, Peter Cook, Secret Policeman's Ball, Terry Jones on June 27, 2014 by howardjohnson1985. 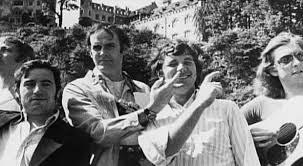 It was 44 years ago this week, on June 26, 1970, that the Pythons started recording the second series of Monty Python’s Flying Circus. 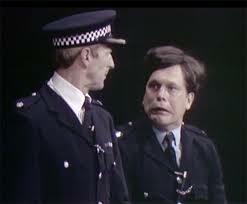 The Pythons shot most of their film segments during the summer, so that when they went into the BBC studios to tape the programs before an audience, the outside segments could be shown to an audience and edited in afterward. And that is why, when John Cleese walks along the street, walking silly, he changes from film to tape when he walks onto the studio set. Every time I’ve seen Terry G perform “I’ve Got Two Legs” (City Center, Hollywood Bowl), he increases his altitude. But it looks like the O2 is going to top them all… BTW, any guesses what’s in the backpack (frontpack) around his waist? If he’s running true to form, it’ll be something disgusting. I’ve Got Two Legs: This Terry Gilliam song has, I believe, been performed in the Drury Lane, City Center, and Hollywood Bowl shows, with Terry being hoisted up on a wire. See photo. Spanish Inquisition: this is one of the classic sketches that I don’t think has been performed live in a Python show before. It’s complicated by the fact that Graham isn’t here to note that there’s trouble at the mill, but someone else could play this somewhat smaller role, or Graham could do it on video. LLamas: This is a particularly silly thing that has been in virtually all the stage shows, for no particular reason. Why should this one be any different? The Most Awful Family in Britain/Church Police: this was one that they used to love to close the show with; it was a great ensemble piece, allowed them to mug in the extreme, and allowed Terry Gilliam to load up on “More beans.” I suspect the lack of Graham was a factor in choosing to leave this out. Most of the cast scenes that involve Graham. Unless, of course, they can be displayed on video. Otherwise, I wouldn’t be surprised to see the Colin “Bomber” Harris wrestling scene, as it’s a stand-alone. 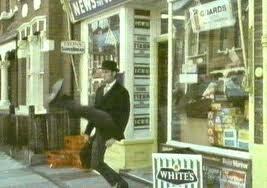 Silly Walks: It’s too iconic to leave out, but John won’t want to perform this with his bionic hip. So, look for a singing and dancing version. 32 years ago this week Terry Gilliam and Graham Chapman appeared on Late Night with David Letterman for the premiere of the film of Monty Python Live at the Hollywood Bowl. This entry was posted in Monty Python, Uncategorized and tagged Graham Chapman, Late Night with David Letterman, Monty Python Live at the Hollywood Bowl, Terry Gilliam on June 23, 2014 by howardjohnson1985. 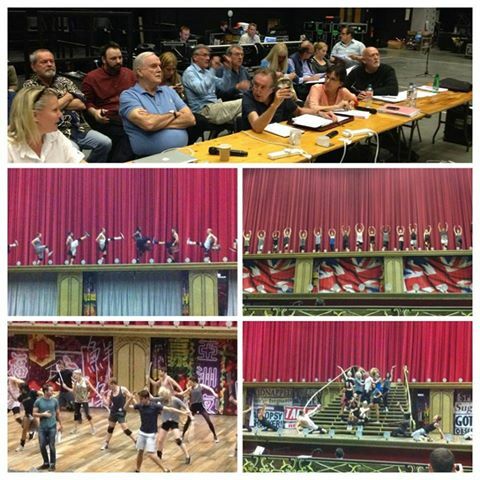 In advance of Monty Python Live, which opens next week(! 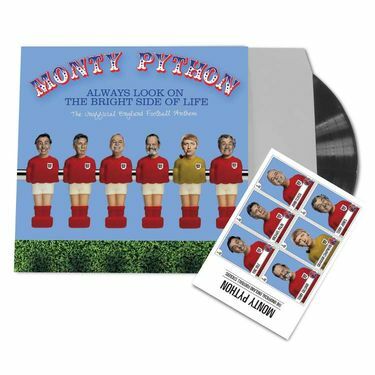 ), and in observance of the World Cup, the Pythons are releasing a very limited edition 12″ vinyl version of the new “Always Look on the Bright Side of Life.” And, it’s backed with “An Apology from Bernard,” a brand new cut featuring a much older Michael Palin and Terry Jones, and the late Graham Chapman. And, they’re even throwing in a sheet of Python football stickers. Written by Eric Idle for the final sequence of Monty Python’s second feature film, The Life of Brian (1979), Always Look on the Bright Side of Life is probably the best known and most popular Python song of all and has become established as favourite sing-along at both funerals and sporting events. Its cheerfully stoic message found particular resonance with football fans and was initially adopted as a chant by fans of Sheffield Wednesday at the dawn of the 1990s, before becoming part of the repertoire of England fans experiencing deflating failures at major international tournaments. For this version, Eric Idle specially adapted the lyrics for use during this year’s World Cup in Brazil, should England (as generally expected) fail to triumph. The B-side is unavailable anywhere else; a highly amusing new recording helmed by Michael Palin (in the guise of the avuncular and somewhat beleaguered Bernard from the record company) and also featuring cameos from Terry Jones and the late Graham Chapman. This package is completed by a Panini-esque sheet of stickers featuring the Pythons in the association football garb; probably the funniest six-a-side outfit in the history of the beautiful game. This entry was posted in Monty Python, Uncategorized on June 23, 2014 by howardjohnson1985. This entry was posted in Monty Python, Uncategorized and tagged Monty Python, Monty Python Live on June 22, 2014 by howardjohnson1985. It took months for the Pythons to come up with a name for their show. Many were chosen and discarded, and some of those were recycled and used as the titles for individual episodes. Finally, the BBC announced that their time had run out, and they were simply going to have to make a selection, whether they liked it or not. The BBC had been referring to the show as “The Circus” in their scheduling books, and that eventually transformed into “The Flying Circus.” For a brief time, the BBC was referring to it as “Baron von Took’s Flying Circus,” after Barry Took, Head of Comedy at that time and a champion of the show. And so, there was a period in which “Flying Circus” was established, but no one knew exactly whose flying circus it would be. 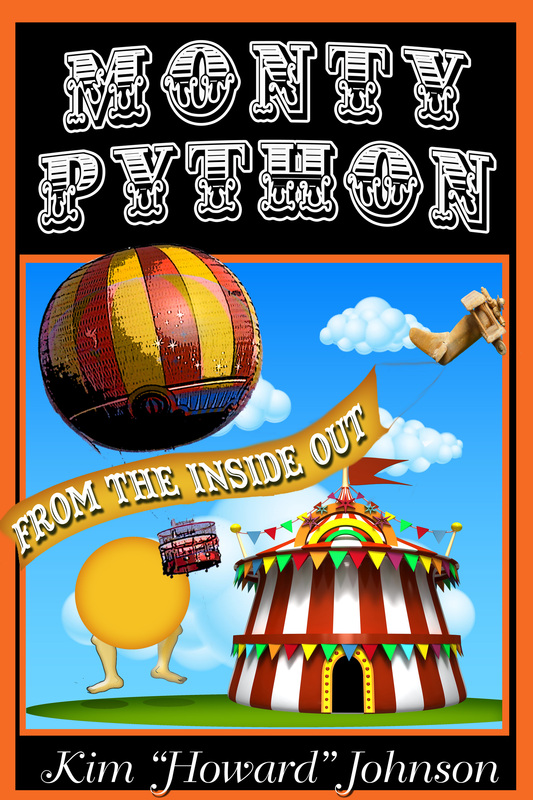 I’ve been blogging a lot about Python lately, and I have a feeling it’ll continue that way for a while–at least through the end of July, when the Reunion shows end and I return from London. But I don’t mind if you don’t.